I think it's interesting that the ROAD specialties as well as Surgery are more red, whereas medical specialties are more blue. I suppose it correlates very well with income. It also seems to correlate well with more female-oriented specialties. Some things don't entirely make sense to me though. Why are ID docs so liberal? And why are Family Med docs more red than blue? Also, most of the specialties that are blue require a lot of empathy. I think supporting politics that privilege the underprivileged, even if it comes to a cost to you personally, requires at least a certain amount of empathy. The further you go down the chart the more likely the interaction with patients with diseases or situations that may be out of the patient's control. Provides a different view to empathize with. From the middle (the 50/50 split) to the top you see those that tend to have to take care of people from all walks of life.. And of course the ones you generally take care of in the hospital are the ones that have multiple comorbidities. As our population continues to get bigger and sicker, it's hard to have empathy for situations that arise from poor personal life choices. when we work with specialties, we consider internal medicine, family medicine, pediatrics, geriatrics, and a couple others to potentially be a member's "primary care provider"
Of those, family medicine is the only one that IMO has potential political / social connotations (think "family values"), so the conservative lean could be due to self-selecting a slightly different designation. Family med docs are more likely to be rural. There's a huge urban/rural split between Dem/Repub. ID is intimately tied to public health efforts that need centralization and federal funding to be successful. I also think it's that a lot of family medicine doctors, more than the other specialties, tend to be private practice (also called "small business owners"). 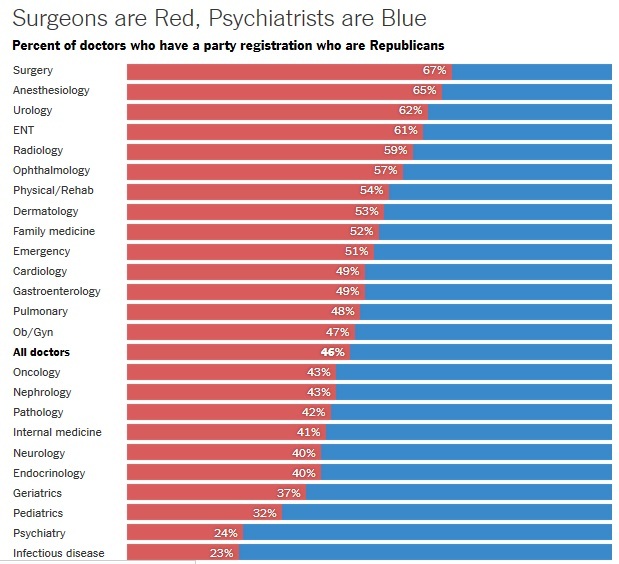 The Republican party has traditionally been the party of business, so I wonder if those who are running their own practices and are considering the business side a bit more heavily than other doctors would therefore lean more Republican. It's funny to think that liberals consider themselves "do-gooders" and the other party not so much. Anonymous, as a general rule, I agree with SheMozart. Who wants politics that protect the poor? That touch our very pockets? And so on? I don't see that coming from Republicans. I'm in Anesthesiology and I get the sense that most of the people in my department are not voting for Trump. That said, I do wonder how many of them are just saying that because they know better than to open their mouths.